At F8 on Thursday, The Social Network will by all accounts be making its official foray into music, with scrobbling and music content galore headed straight for our news feeds. Ahead of Facebook’s new music service, Vimeo is announcing its own musical news, thank you very much, that has some interesting implications for artists and filmmakers and music technology. You may know Vimeo as the quality YouTube alternative that’s long been a place for semi-pro videographers, filmmakers, and Vloggers to host, share, and present their video content. Today, Vimeo is taking its long-awaited leap into the music world with the “Vimeo Music Store” — a custom-designed music licensing solution that will allow Vimeo’s video buffs to search for, discover, and license songs for both non-commercial and limited commercial use. Powering the nuts, bolts, and backend of the Vimeo Music Store will be Audiosocket’s Music-as-a-Service (or MaaS) platform, a cloud solution designed to allow digital media companies to easily integrate music search, discovery, and licensing. 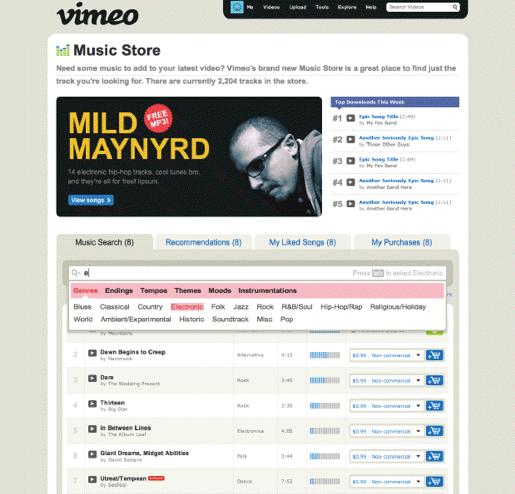 The Vimeo Music Store, which represents the first commercial implementation of Audiosocket’s solution, will allow users to take advantage of all the benefits of a music library that contains more than 100 categories of integrated metadata, all from inside the friendly confines of Vimeo’s platform. 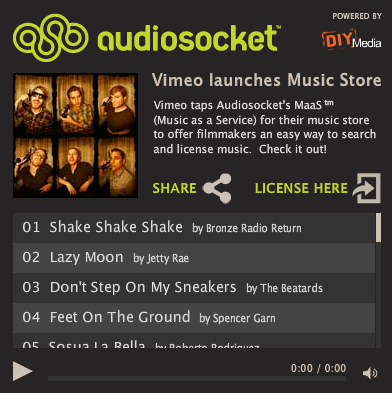 Vimeo users will also have the benefit of access to Audiosocket’s library of 33,000+ legit songs in the new music store, enabling the video platform’s users to select and license a wide variety of tracks that they can use as soundtracks for their video productions, with the ability to then distribute them over the Web, and film festivals, and so on, without worrying about an RIAA SWAT team descending from the roof. On the flip side of the partnership, Audiosocket’s music artists will now have the benefit of a sizable new distribution channel (along with guaranteed royalty payments on licensed music) and exposure to Vimeo’s audience of more than 50 million monthly visitors — many of them semi-pro and professional filmmakers. It’s also great to see the evolution in the relationship between music and technology — and now the cloud — as Audiosocket’s MaaS platform, which is designed for integration into video and photo sharing platforms, virtual worlds, online games and social networks, could have a disruptive effect on the way music is licensed in digital media. And we all know how much music licensing has been in the need of workable, affordable solutions (really, innovation). Just ask Napster. After all, when you get down to it, amateur filmmakers really have no idea where to start when it comes to music licensing, and vice versa; both parties want to take advantage of the benefits without the hassle, but they’re by and large clueless on where to start. Of course, it remains to be seen whether Vimeo users will be willing to pay to license Audiosocket’s music content, the pricing structure of which currently stands at $1.99 per track for personal, non-commercial, and web-use for casual users and $98 per track for commercial, web-use licenses for professional users. Thankfully, much of the content will be available for free thanks to Creative Commons Licensing, but professional users may be heard issuing a few groans. Nonetheless, this could really be a real future-altering partnership for Audiosocket and is no doubt a great bonus for Vimeo users, but it also seems as if the video platform will need to go bigger with its song catalog if it’s to truly make waves. For more, readers can check out an embeddable widget which includes sample tracks from Audiosocket’s library here and for a look at the Vimeo Music Store, check it out at home here.